When I was asked to guest for this bloghop I made a little happy dance! I am so honored to be here! I have used stamps from Technique Tuesday before and I said it then and I´ll say it again; I am not a very good stamper. But these stamps are so easy to use and it is with no effort you can get a really good result! Here is the Best Banners stamp set! The stamp set Best Banners is so fun since you can use it for many different projects. Before I had decided what to make, I stamped a few of the banners on watercolor paper. Then I used my watercolors to add some color to them. I remembered that Valentine´s Day was coming up, and I love that day, so I made a garland. 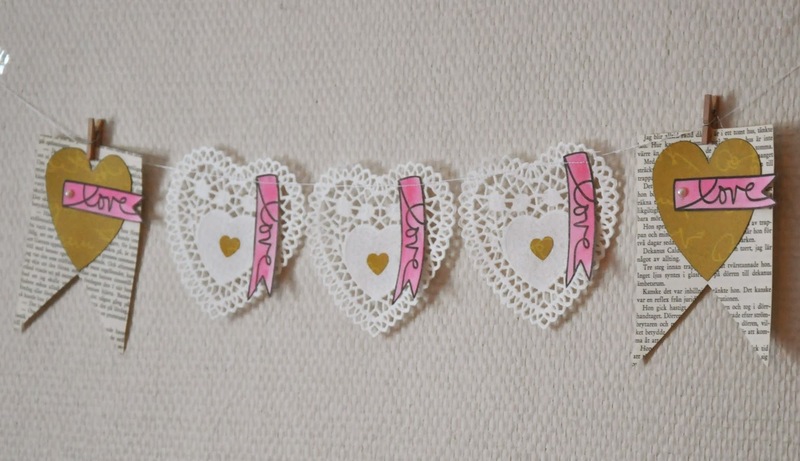 I had a few of these doily hearts at hand from Wilton and just added the watercolored banners to them. I used a little glue to attach them before running everything through my sewing machine. Originally I only had the three doily hearts, but I wanted to add a bit more. So I cut the banners from one of my thrifted vintage books, traced a heart on patterned paper and added more stamped banners. I love how it turned out and promptly made a few more projects with the stamps! If you check back in a few days I´ll have them up in another post! Now, go ahead and hop on to the other blogs for much more inspiration! Your banner is really gorgeous !!!! I love the colors you used. I just love Valentine's Day banners! this garland is so pretty! Great banner Lisa! Love the way you used the stamps to add that special little touch. This is so cute, thanks for sharing!! I love those stamps, great banner Lisa ! 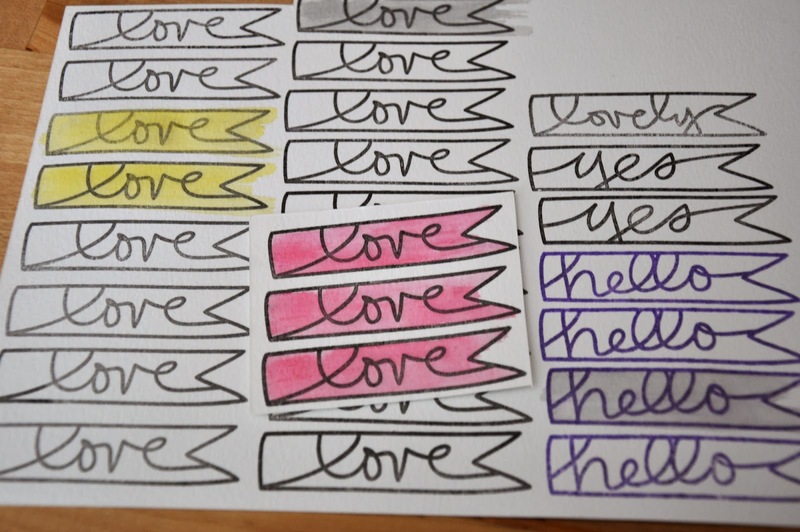 What a cute and clever way to use these stamps, love your banner! Such a great way to use these stamps! Love it! I love banners and yours is so darling with all the little love flags! Very cute banner--I like how you used the love stamp. 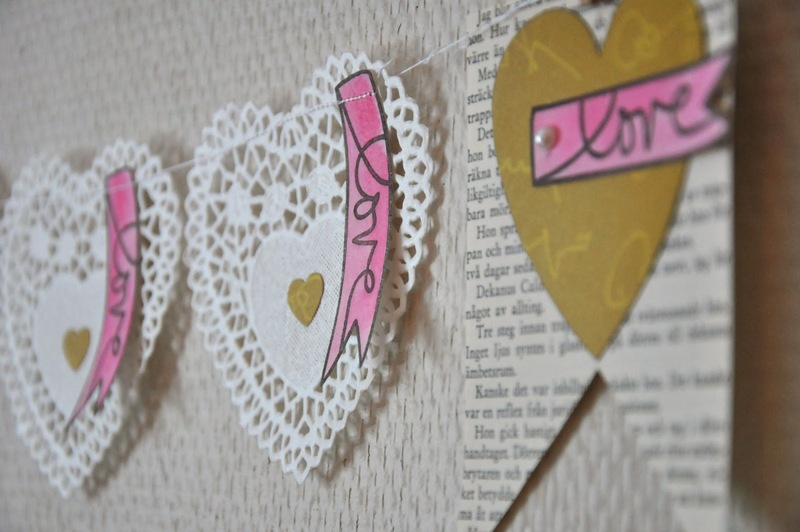 What a cute little doily banner...great way to use the stamps. Love the use of the little banners and the dollies on this garland. Thanks for sharing. Lovely banner. Another great way to use these stamps. Thanks for sharing! Cool banner. I like the gold hearts. What a great banner for valentines! What a sweet banner. Love the heart shape doilies and those pink banner words. This is so adorable! I love the way you used the stamps! LOVE YOUR BANNER! The sentiments are perfect! Super cute! Great inspiration ideas. I'm usually not a banner person, but this is so sweet I love it! Colors are perfect and the mix of hearts is too! Thanks for sharing. Very sweet banner. Great new banner stamp. Love your sweet heart garland! The banner stamps are fabulous! Love your banner!!! Super cute! Great banner! Thanks for sharing! Love this banner, so cute! Love how you included the stamps too. :) Thanks for sharing. What an adorable banner. Love the use of the watercolors to create the color.